GoPro has released its latest feature that further enables users to effortlessly share their memorable moments captured on their GoPro devices. 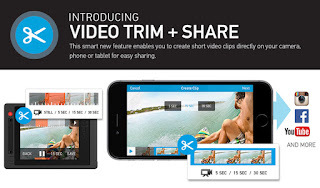 This smart new feature allows the user to create short video clips directly on the camera or mobile device for easy sharing. Simply press the Trim icon in playback mode, choose a 5-, 15-, or 30-second clip from any of your recorded content, and save it for sharing, all without transferring entire video files. On-camera trimming, available on HERO4 Black with LCD BacPac, HERO4 Silver, and HERO+ LCD, allows you to save your trimmed file directly back onto the memory card, adjacent to the rest of the video files for later sharing. As well, the in-app functionality will allow for instant saving to your camera roll and very precise trimming from all Wi-Fi enabled GoPro cameras. About GoPro, Inc. (NASDAQ: GPRO) GoPro, Inc. is transforming the way people capture and share their lives. What began as an idea to help athletes self-document themselves engaged in sports has become a widely adopted solution for people to capture themselves engaged in their interests, whatever they may be. From extreme to mainstream, professional to consumer, GoPro enables the world to capture and share its passion. And in turn, the world has helped GoPro become one of the most exciting and aspirational companies of our time. 0 comments on "GoPro Releases New Trim and Share Feature for App and Wi-Fi enabled HERO Cameras"